She is driving me nuts! I have been searching and searching for my paternal great-grandmother LouElla JARBOE's death date. The last citing on earth was abt: 1903 - 1904. She married my great-grandfather, Robert Denton IJAMES, b. 15 Jan 1873, Owensboro, KY, d. 20 Aug 1903 from an appendicitis. 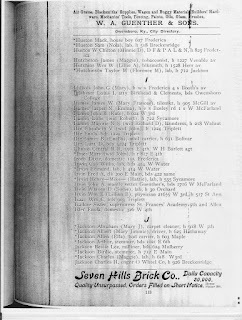 Father: William JARBOE (no dates) I have also seen her father's name as: William David JARBOE or David William JARBOE. 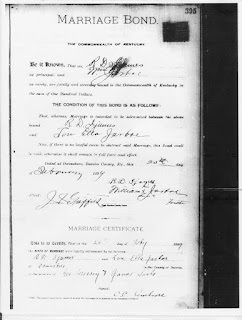 Married my paternal Great Grandfather, Robert Denton IJAMES 20 February 1894 or 1899 (hard to read date on Marriage Bond below). 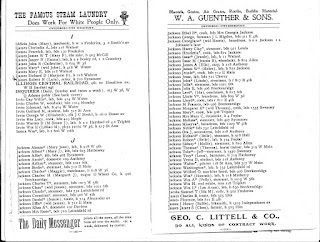 W. A. GUENTHER & SONS. 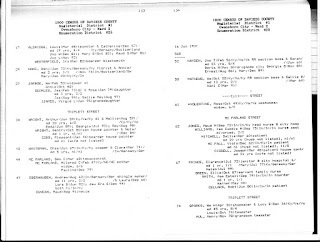 Source: 1903 - 1904 Owensboro City Directory, copied from Daviees County Public Library, Kentucky Room, 2020 Frederica Street, Owensboro, KY 42301, copy held by Gini Webb, San Diego, CA (address for private use) April 2008. I have searched on Ancestry.com to no avail. There are LouElla Jarboes, but not mine. I have also left messages on the Ancestry.com message boards, nothing yet. 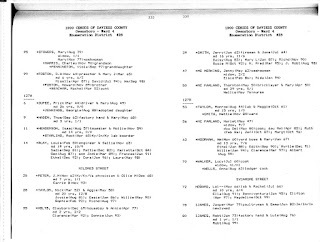 My Aunt Virginia has actually contacted an archivist in the court house in Hardinsburg, KY, no findings there. 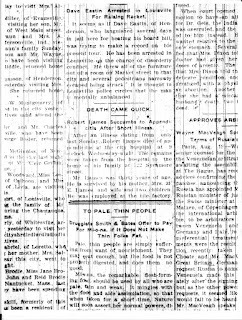 After putting a call into the Kentucky Room, I was contacted by a gentleman that works in the Kentucky Room from the Owensboro Library in KY and it turned out that we are distantly related thru the PATE line and he said he had been looking for LouElla too and has found nothing on her death or anything after 1903-1904. 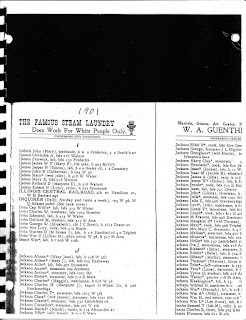 No obituaries, death certs., Census records. She disappeared into thin air, very frustrating. I would love to knock down this brickwall more than anything and I refuse to give up! 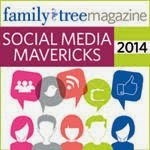 I have tried freebie sites but unable to come up with anything there too. This is my first time for "MADNESS MONDAY" and hopefully gave as much info as possible. WHERE ARE YOU GREAT GRANDMA LOUELLA!!!!!??? ?